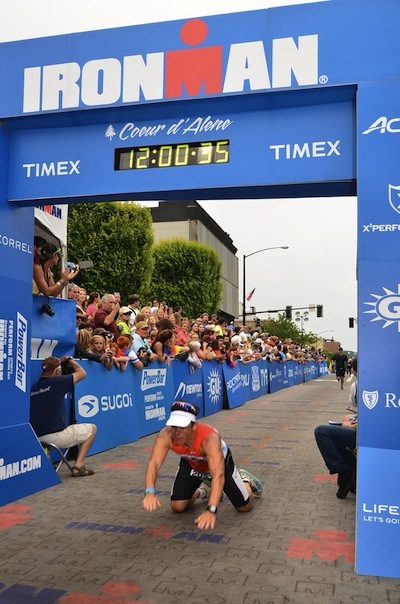 Coeur d’Alene 2013 was Dino Sarti’s first Ironman® and, more importantly, was a significant milestone in a personal health and lifestyle transformation that he began over 3 years, and many, many pounds ago. Dino is local to Coach Rich, and he’s had the pleasure of training with Dino, watching him grow as an athlete and student of the sport. More importantly, Coach Rich has watched him subscribe fully to Endurance Nation’s unofficial motto that “Work is Speed Entering the Body.” Dino’s results speak for themselves. Step three, get really serious! I joined Endurance Nation at the end of 2011. Joining EN brought my training to the next level. I had a serious plan for getting stronger and faster and I was now plugged into a knowledge base second to none in the long course community. Here is where I learned that “work works” and that “work is speed entering your body”. Without this team and these resources, I think I could have survived Ironman, but EN allowed me to THRIVE at Ironman. At the end of June 2012, I made the decision to step up and go for it. I registered for Ironman® Coeur d’Alene and then had a YEAR to think about it. Along the way to Coeur d’Alene I crashed three times and broke my collar bone, conquered Ironman® California 70.3 (1/2 Ironman® distance), and was crushed byWildflower (1/2 Ironman® distance). Read the rest of Dino’s very detailed and most excellent race report on his blog. Listen to Coach Rich’s interview with Dino, including a great discussion of the logistics and inside scoop on Ironman’s new swim start protocol.